New People’s Bank of China Governor Yi Gang pledged to further open the financial markets in the Boao Forum for Asian in China. And some specifics were offered by Yi too. Firstly, the government will remove foreign ownership caps on Chinese banks by the end of June. Secondly, foreign securities and life insurance companies will be allowed to hold majority stakes in their Chinese counterparts. That is, ownership could be raised from 49% to 51%. And such restriction will also be abolished in three years. Thirdly, by the end of June, the permitted business scope for foreign insurance agents will be expanded. Fourthly, the daily quota for foreign investors to buy Chinese stocks and for Chinese investors to buy Hong Kong traded stocks will be quadrupled. In addition, by the end of 2018, China will launch a trading link between Shanghai stock markets to London’s. Separately, Yi also said that China won’t devalue Yuan as part of the moves of trade war with the US. UK PMI manufacturing dropped to 52.0 in February, down from 52.6 and matched expectation. Markit noted that stocks on inputs and finished goods rose sharpy. However, rate of job losses was at six-year high as optimism hits series low. “With Brexit day looming, UK manufacturers continued to implement plans to mitigate potential disruptions. Stockpiling of both inputs and finished products remained the order of the day, with growth in the former hitting a fresh record high. “The current elevated degree of uncertainty is also having knock-on effects for business confidence and employment, with optimism at its lowest ebb in the survey’s history and the rate of job losses accelerating to a six-year high. “Official data confirm that manufacturing is already in recession, and the February PMI offers little evidence that any short-lived boost to output from stock-building is sufficient to claw the sector back into growth territory. Also from UK, mortgage approvals rose to 67k in January. M4 money supply rose 0.2% mom in January. Germany’s leading economic institutes lowered economic growth forecasts for the country in 2019 sharply. GDP is projected to rise just 0.8%, down from Autumn 2018 forecasts of 1.9%. Nevertheless, for 2020, GDP is projected to grow 1.8%, unrevised. The state was released by joint project group “Gemeinschaftsdiagnose”: German Institute for Economic Research (DIW Berlin), Halle Institute for Economic Research (IWH) – Member of the Leibniz Association, ifo Institute – Leibniz Institute for Economic Research at the University of Munich in cooperation with the KOF Swiss Economic Institute at ETH Zurich, Kiel Institute for the World Economy (IfW), RWI – Leibniz Institute for Economic Research in cooperation with the Institute for Advanced Studies Vienna. He added that “anybody looking at it objectively would say that what is on offer from the EU is a far worse deal than a no deal, and therefore she’d be mad to be railroaded into accepting it.” In his view, UK Prime Minister Theresa May will not get what EU are demanding through the House of Commons. Below is the full text of the joint statement following the meeting between European President Jean-Claude Juncker and US President Donald Trump. In short, both sides agreed to strengthen the trade relationship and make trade fairer and more reciprocal. The agreed to worked together toward ” zero tariffs, zero non-tariff barriers, and zero subsidies on non-auto industrial goods” and increase trade and services, soybeans and other products. The agricultural sector will be opened and energy partnership strengthened. And, both sides agreed to join forces against “unfair global trade practices”. And specifically, they the practices include “intellectual property theft, forced technology transfer, industrial subsidies, distortions created by state owned enterprises, and overcapacity.” That’s exactly talking about China. Dollar and Yen remain the strongest one in mid-US session, after European close. However, for now, it’s uncertain whether they can sustain the gains before US close. Risk aversion is a key driver in the strengthen of them. But judging from the actions in the US markets, it’s hard to say whether the major indices will close the day up or down. DOW dropped to as low as 25479 initially but is now down just -0.14% at 25763. S&P 500 dropped top as low as 2781 but it’s now up 0.13% at 2814. Similarly, NSDAQ dropped to as low as 7563 but it’s now up 0.04% at 7468. On the other hand, Canadian overtook Sterling’s place as the weakest one after larger than expected oil inventory increase sent WTI crude oil to 70. Selling pressing in oil and the Loonie could persist. Sterling was sold off earlier today after UK CPI miss and stays week. The Pound fate will depend on the outcome of the “moment of truth” EU summit. Italian 10 year yield rose 0.0841 to 3.545. Euro records broad based gains in Asian session today and is trading as the second strongest for today. It’s indeed the strongest one for the week so far. We not seeing any apparent fundamental reason of the Euro’s own for the rally. But the EUR/USD’s reject from 1.1507 support thanks to Dollar’s pullback is a factor. Sterling’s persistent weakness in worries on no-deal Brexit is another favorable factor for Euro. Technically, EUR/USD’s break of 1.1610 minor resistance should indicate near term bottoming at 1.1529, ahead of 1.1507 key support. The consolidation pattern from 1.1509 is starting another rising leg. 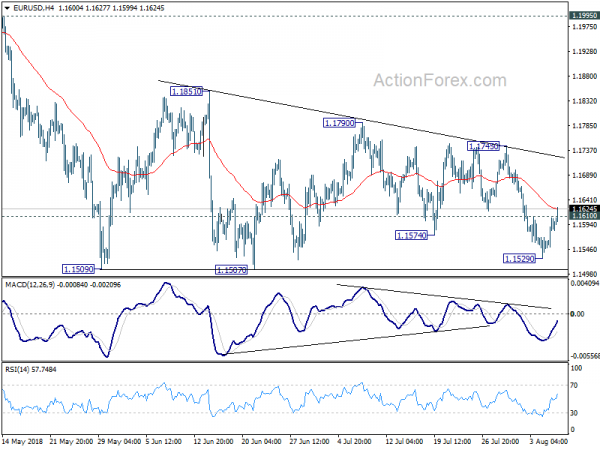 EUR/USD would be targeting 1.1745 resistance next as the pattern extends. 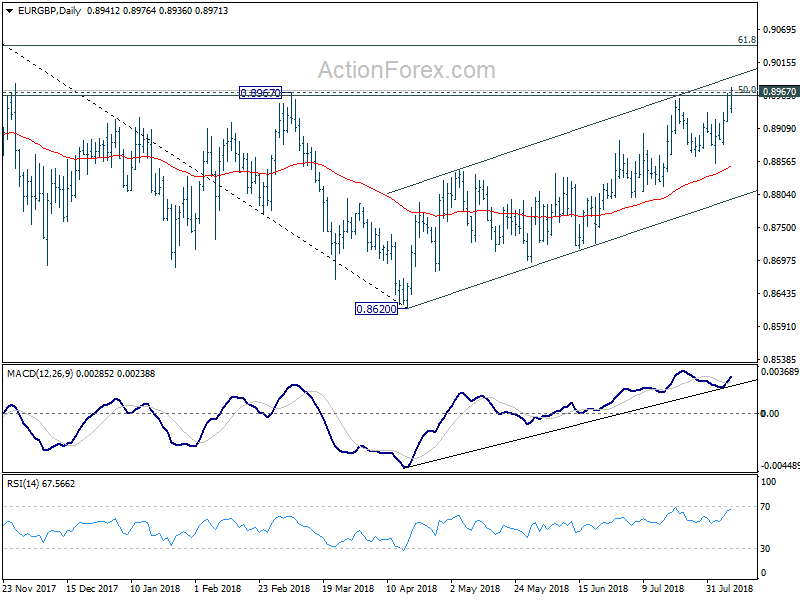 EUR/GBP also finally breaks 0.8967 key cluster resistance level. The upper channel resistance might be an obstacle for the near term. But we’d expect rise from 0.8620 to extend to 61.8% retracement of 0.9305 to 0.8620 at 0.9043. The rise in EUR/GBP would help support Euro elsewhere. On the other hand, a UK government spokeswoman defended that the proposal is ” precise, pragmatic and that will work for the UK and the EU.” And, “this proposal achieves a new balance of rights and obligations that fulfils our joint ambition to establish a deep and special partnership once the UK has left the EU while preserving the constitutional integrity of the UK. There is no other proposal that does that. The UK Treasury announced today that BoE Governor Mark Carney will extend his term until January 2020. Carney has originally planned to step down in June 2019. Chancellor of Exchequer Philip Hammond said in the release that I’m delighted that the Governor has agreed to stay in his role for a further seven months to support a smooth exit from the European Union and provide vital stability for our economy. In the same release, Jon Cunliffe was re-appointed as Deputy Governor till October 2023. UK PMI construction rose to 52.5 in April, up fro 47.0 and beat expectation of 50.5. That’s also the highest reading in 5 months. 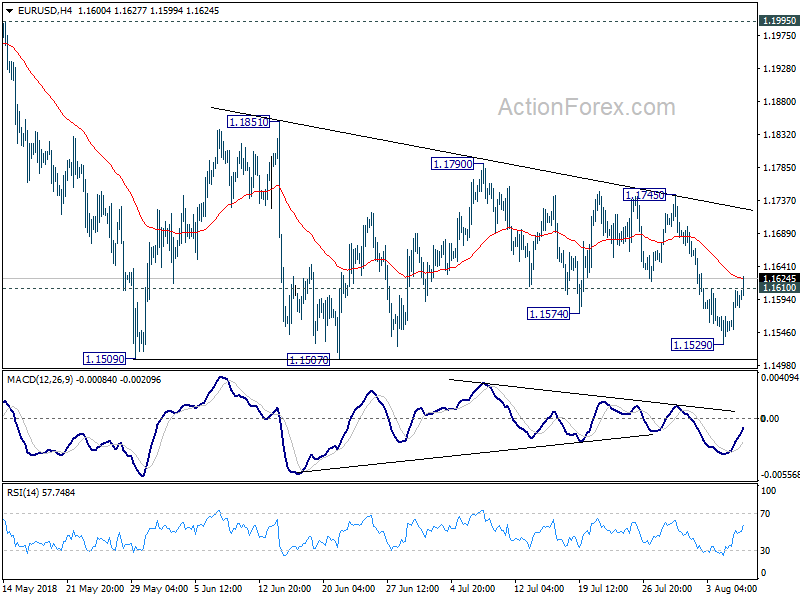 GBP responds positive to the upside surprise and is attempting to rebound. “A rebound in construction activity was pretty well inevitable after snowfall resulted in severe disruptions on site during March. House building led the way, with growth in April among the strongest seen over the past two-and-a-half years. However, the picture was less positive in other areas of construction, with commercial building and civil engineering work rising only marginally. Fed chair Jerome Powell said in a speech that Fed has made “great deal of progress towards” a “strong economy and sound financial system”. He pointed to unemployment rate at 3.7% and strong job creation. And there are others signs of strength beyond the labor market. He noted the decline in financial hardship, wage gains, increased household wealth, and elevated consumer confidence. However Powell also pointed to some “longer-term challenges”. Those include slow growth in wages for lower-income workers. Also, it’s unclear if recent pick up in productivity is a sustainable trend. And, aging population is limiting labor supply growth and potential growth. Decline in economic mobility also reflects the difficulty faced by lower-income Americans in moving up the economic ladder. US initial jobless claims rose 9k to 217k in the week ended July 21, below expectation of 221k. The four-week moving average of initial claims dropped -2.75k to 218k. Continuing claims dropped -8k to 1.745m. The four-week moving average of continuing claims rose 9.5k to 1.74575m. Headline durable goods orders rose 1.0% in June, well below expectation of 2.5%. Ex-transport orders rose 0.4%, above expectation of 0.3%. Wholesale inventories rose 0.0% mom versus expectation of 0.3% mom. Dollar is relatively unmoved after the releases. In addition, he described the depreciation of Lira as an economy as it’s experience “fake volatility” as result of manipulations. Erdogan also pledged to implement measures to solve Lira volatility issues. According to a Reuters poll, CBRT is expected to hike the benchmark interest rate by between 225 to 725 basis points. Seems like the markets are setting up themselves for disappointments. USD/TRY hit as high as 6.5514 after the comments and it’s now up around 2%. Chinese Yuan’s selloff picks up some momentum today. 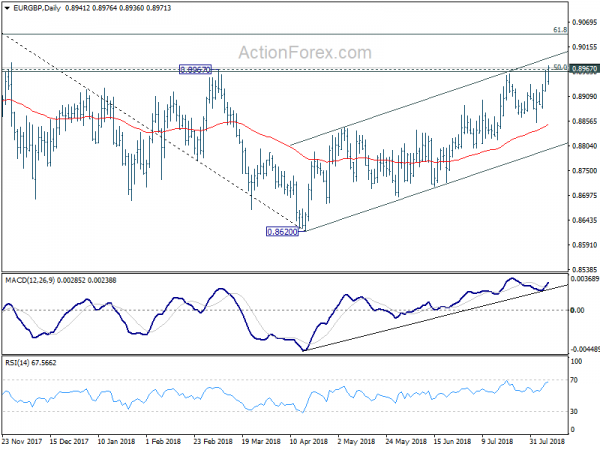 USD/CNH (offshore) break 6.9586 yesterday, as well as a near term channel resistance. The upside acceleration suggests that Yuan selling might intensify for the near term. Now, it looks like a break of 6.9875 high in USD/CNH (2017) low is inevitable. That is, Yuan will hit the lowest level in a decade. The question now is whether there will be intervention of some sort to keep USD/CNH below 7.000 handle. Reactions in the stock markets are muted though. At the time of writing, the Shanghai SSE is down just -0.46% at 2591. Hong Kong HSI is also down -1.09% only as recent down trend extends steadily. European Commission formally announced retaliation to US steel and aluminum tariffs today. The total EU exports to the US affected by the US measures is at EUR 6.4B. For now, EU will target US products in EUR 2.8B worth first, effective on Friday June 22. Duties on the remaining EUR 3.6B in US goods will take place at a later stage, “in three years’ time or after a positive finding in WTO dispute settlements. This is the list of products for rebalancing. European Council President Donald Tusk emphasized that the Irish border issue is a top priority in Brexit negotiation. He said that “if in London someone assumes that the negotiations will deal with other issues first, before moving to the Irish issue, my response would be: Ireland first.” And he warned that “as long as the UK doesn’t present such a solution” regarding a soft border in Ireland, it is very difficult to imagine substantive progress in Brexit negotiations”. In addition, Tusk explained that “services are not about tariffs. Services are about common rules, common supervision and common enforcement to ensure a level playing field, to ensure the integrity of the single market and, ultimately, also to ensure financial stability. This is why we cannot offer the same in services as we can offer in goods. It’s also why FTAs don’t have detailed rules for financial services.” That is, financial services will be bluntly excluded from the Brexit deal.